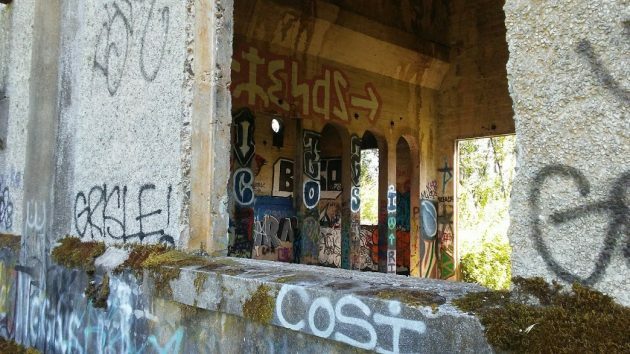 It was three years ago, in April 2015, that I wrote about the former Pirtle power transfer station on the old Oregon Electric Railway. Last week I looked at it again and, no surprise, it and the graffiti are still there. Actually, the old graffiti may have been replaced by new ones. So even though this relic of our railroad history has been abandoned by everybody else, spray-paint vandals keep coming back. Or new ones come and use it as their canvas for the first time. 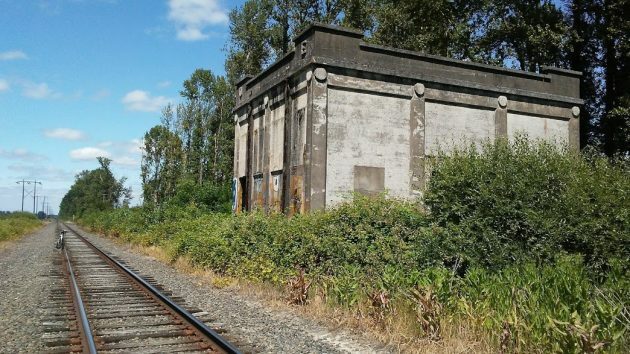 This concrete box was constructed to house generating equipment to power a section of the electric railroad that was built from Portland to Salem in 1907-8 and reached Albany and Eugene in 1912. The line ended passenger service in 1932 and electric freight service in 1945. Now, the track in the mid-valley is owned by BNSF and leased to the Portland & Western Railroad. Neither BNSF, successor to the Burlington Northern, nor the Portland & Western have shown any interest in demolishing this massive structure by the side of the track south of Albany, or in taking steps to secure and preserve it. Looking at a map of tax lots, though, I noticed a strip of land 50 feet wide leading from the railroad right of way due east through farm fields to Oakville Road. The strip, it turned out, was designated for a road in the “Pirtle Home Tracts Plat No. 3,” a subdivision of 24 home sites recorded in 1913 by Grant Pirtle and Charles H. Wieder, the president and secretary, respectively, of the Pirtle-Wieder Co.
Spray paint inside and out: Old station shows the signs of continued vandalism. Thanks for the history lesson, Hasso. Nice to read something other than the current national nightmare. Gosh so sad that this fast, clean, and convenient mass transit service was abandoned! Seems a real loss to the almighty personal auto with all the associated side effects. I wonder if the developers of the housing tracts anticipated home owners could commute to Albany, Salem, even Eugene for work and commerce? A simpler time allowed simple and sane conveyance … wish Amtrak could adopt some historic wisdom! By the way: THANK YOU Mr. Hering for letting me ride your handlebars during your wanderings … your curiosity and research and photos are appreciated! Yes I wondered what the building was. Dear Hering, thanks for making us aware of this situation. The reality that the so-called “vandalization” of this unused construct should, perhaps be viewed through “other eyes.” When the Pirtle era was in vogue, the Vogue was what Pirtle claimed it was. Eventually truth surfaces. All so Cartesian, eventually destructive. What George Harrison did not add to this serenade was, All thing which pass be desecrated by tagging….done so by vandals. Hasso, Nice story on the generator house. Just be wary of a potential backlash from the RR when you convey access to this building via the live RR ROW. The RR goes to great lengths to communicate their ROW is NOT for public use. Tom is right. And it’s not just because of liability. People die messing around RR tracks. I grew up just 200 feet from the mainline. I had a couple close calls myself from being careless. Thank you Mr. Hering for this piece. Very interesting history. I’ve always been fascinated by this building. Very interesting architecture. Another one on Cartney Dr. near Harrisburg; another at McCoy near Perrydale.